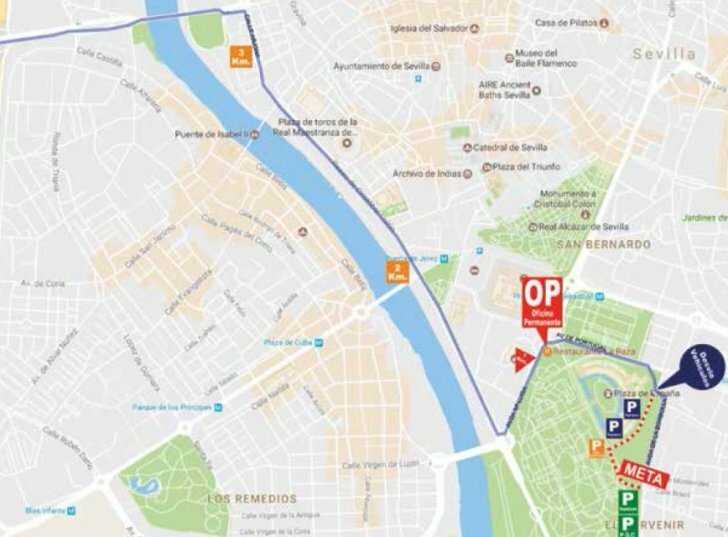 Saturday, 18 February 2017 - The route of stage 4 in the Ruta del Sol, or Vuelta a Andalucia, travels to one of the most beautiful city in Spain, Seville. The 179.3 kilometres race takes in some climbs, yet the finale is flat. Stage 4 of the Vuelta a Andalucia leaves from La Campana, as the crow flies 50 kilometres northeast of Seville. The route travels through the middle mountains and takes in the climbs up the Alto de las Minas (3rd category), Alto de Constantina (2nd category) and Alto de Cazalla (3rd category). All three ascents are in the first half of the stage. After cresting the Cazella the route travels on rolling roads to sea level and the last 45 kilometres are flat. The arrival is on the boulevard Avenida Maria Luisa in Seville. Last year, stage 1 of the Ruta del Sol arrived in Seville with a bunch sprint. Daniele Bennati took the flowers. Results/race report 4th stage of the 2017 Ruta del Sol.